IT'S A RIGHT CHOICE FOR USING IWISS TOOLS! 1. Pull back on the moving handle and open the jaws fully(tool does not work like pliers, do not force the handles apart. 2. Position jaws squarely around the ring. 3. Gently let the handles open to close the jaws on the ring. 4. Squeeze handles together to complete the crimp. ONE CRIMP ONLY! 5. Pull back on the moving handle to release jaws from the crimped ring. 6. Measure the crimped ring with"GO-No GO" gauge(included). Do not measure bumps on the ring where the jaw meets. 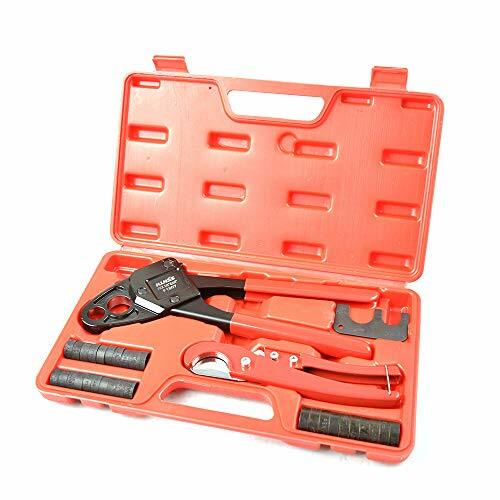 If GO on gauge does not fit, or if NO GO does fit, cut out the connection, replace the fitting and ring, adjust and calibrate the tool and recrimp. Crimp meets ASTM F1807 Standard Specification. Combined 1/2" & 3/4" in One PEX crimp tool and easily calibrated. Perfect POLISHED JAW and Light weight frame and comfort grips make crimping easier. Easy to crimp small corner and save 30% labor with less fatigue without sacrificing tool strength. suit Sharkbite, Watts, Apollo and All US F1807 Standards. If you have any questions about this product by IWISS, contact us by completing and submitting the form below. If you are looking for a specif part number, please include it with your message.